This new blog hop is sponsored by You Did What With Your Weiner, My Life in Blog Years ?and Dachshund Nola. 1) 1) Link up your blog name and URL using the Linky below. 2) Follow your co-hosts, and follow as many other blogs on the linky as you’d like. 3) Please ONLY SUBMIT A FEW PHOTOS with minimal or no text, and make sure it’s in BLACK AND WHITE. 4) Grab the “Black and White Sunday Blog Hop” button and include it in your Sunday Blog post. Aw, I'd like to think you're napping and that's Momma's leg! Have a great Sunday! Quite a grip it looks like. OMG. What a great shot! I love how you captured Bella's nose and paw and claws. I love pictures like this. In black and white it looks awesome. That's a cool angle! Love her tough girl black nails! Woof! I sense a toe nail trimming soon! Isn't it funny how they do that, even while sleeping? Sometimes, Georgia digs hers into me. OUCH. Looks like someone is having a Sleepy Sunday ~ Enjoy! only a dog owner will understand this shot. Beautiful! "My what great big claws you have".....said Goldilocks...."the better to SCRATCH you with my friend!" said The Big Bad Wolf! 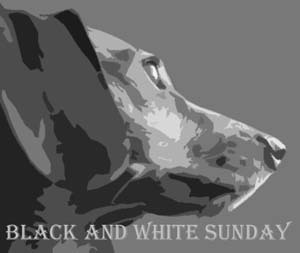 Black & White Sunday: You rang?